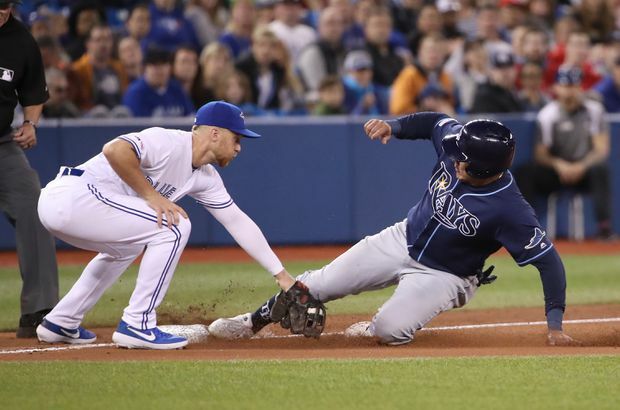 Avisail Garcia (24) of the Tampa Bay Rays advances to third base ahead of the tag by Brandon Drury (3) of the Toronto Blue Jays in the seventh inning in Toronto on April 14, 2019. Heredia’s homer, off Toronto reliever Tim Mayza, gave the American League East-leading Rays (12-4) an 8-2 lead. Marcus Stroman (0-3) lasted just four innings, allowing three hits and three runs – all unearned – with three walks and five strikeouts. Toronto’s Thomas Pannone pitched three perfect innings in relief, including an immaculate fifth where he struck out all three batters on nine pitches. But Toronto’s early errors helped hand their opponents the game. Tampa tied it 1-1 after Lourdes Gurriel Jr. bounced a throw to first on the would-be final out of the third. Stroman walked the next batter and Brandon Lowe followed with an RBI single. Stroman threw 15 extra pitches before he could escape the inning – bringing his total to 69 through three – and Gurriel was replaced in the field by Alen Hanson to start the fourth. Galvis also drove in the game’s opening run in the first. He brought leadoff hitter Billy McKinney home from second with a single off Morton.